Continue to cook over high heat, covering for about two minutes, then uncovering again. This will generate a lot of liquid and start to soften the mushrooms. Now you want to braise them, stirring frequently and keeping the cover off. By the time the liquids have been cooked away, the mushrooms should be close to tender. Take care not to overcook them, you want some texture in this dish. If too much liquid has escaped, add more stock or a mix of stock and shao xing or sherry. Keep stirring. 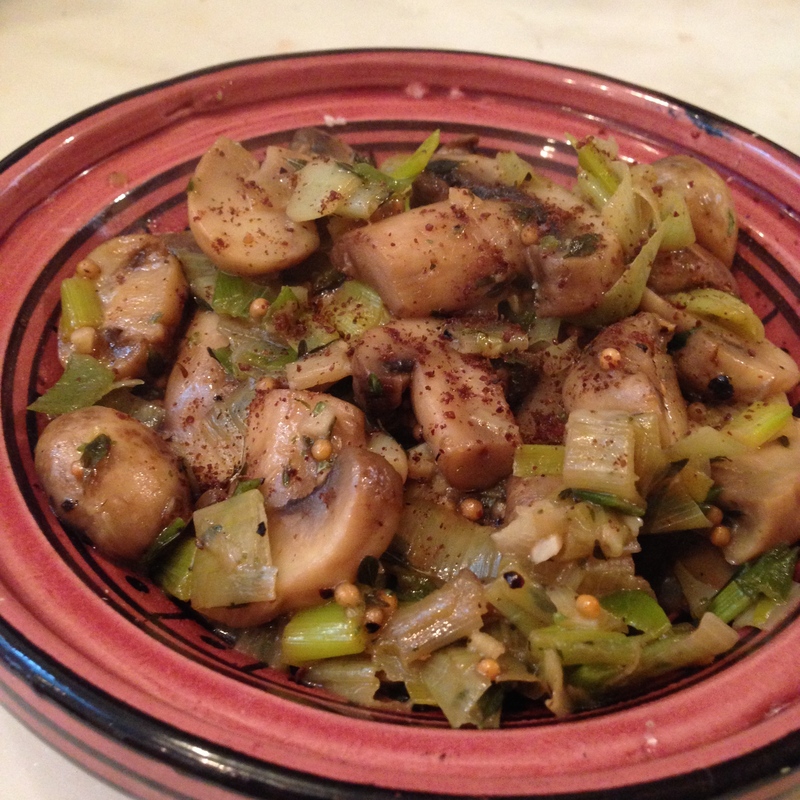 When all the liquid is absorbed and the mushrooms are tender but not soft, turn into a serving dish. Ground sumac and/or clove, freshly ground if possible. Serve either hot or at room temperature. This is an excellent addition to a tapas or meze platter, or served as a side dish to accompany a more traditional main course. The end result can also be chopped once cooked into more of a tapenade, perhaps with a dash of added olive oil, accompanied with bread or fresh raw vegetables. 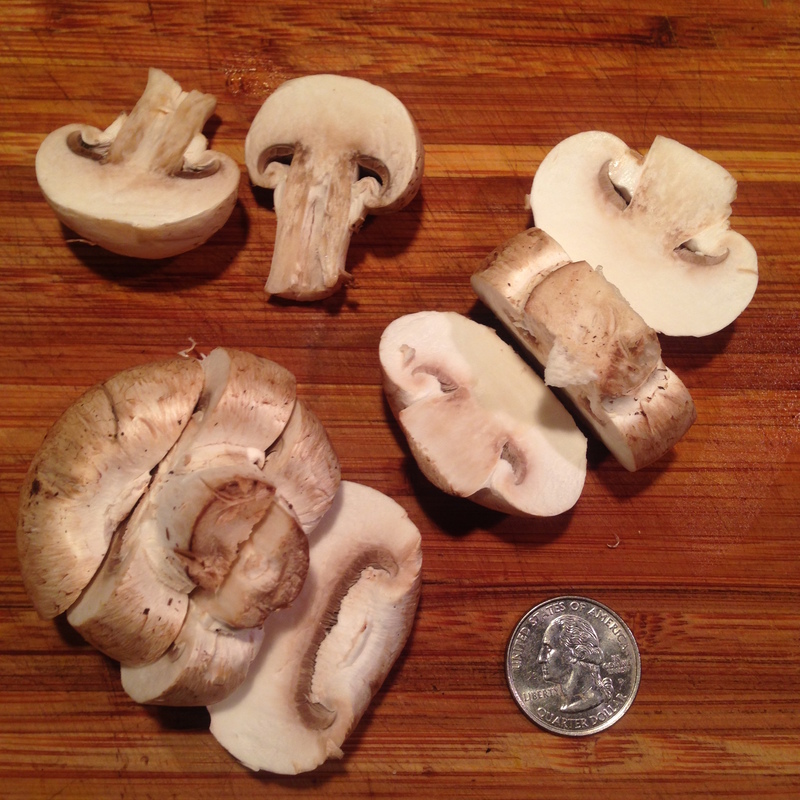 Naturally, wild mushrooms can be substituted for the cultivated ones. I would think a similar textured-mushroom like a blewit or field mushroom would be most adequate. Mushroom cutting technique below. I know, right, so advanced. But if you make nice thick slices like this, they will retain a good texture even after being subjected to a braising like the above. Cauliflower is a delicious vegetable that is too often ill-served by the the one preparing it. The major culprits are boiling (which accentuates its’ heaviness and high water content) and pairing with cream and/or cheese (which accentuate its’ blandness). Prepared with some attention to its’ particular nature, cauliflower need be neither heavy nor bland. The high water content is a problem best handled with high heat and a bit of special attention. This simple dish is one of my favorites to make, one I could happily eat any day. It can be endlessly improvised upon in terms of seasoning, but an even better idea is to prepare it and turn it into something else. Chop some up with olives and pickled onions and peppers and add more oil for a tapenade. Puree it with cooked onions and celery to make a delicious, creamy soup. Add large chunks of pickled vegetables and cooked potatoes and spices and make a potato salad version of aloo gobi. 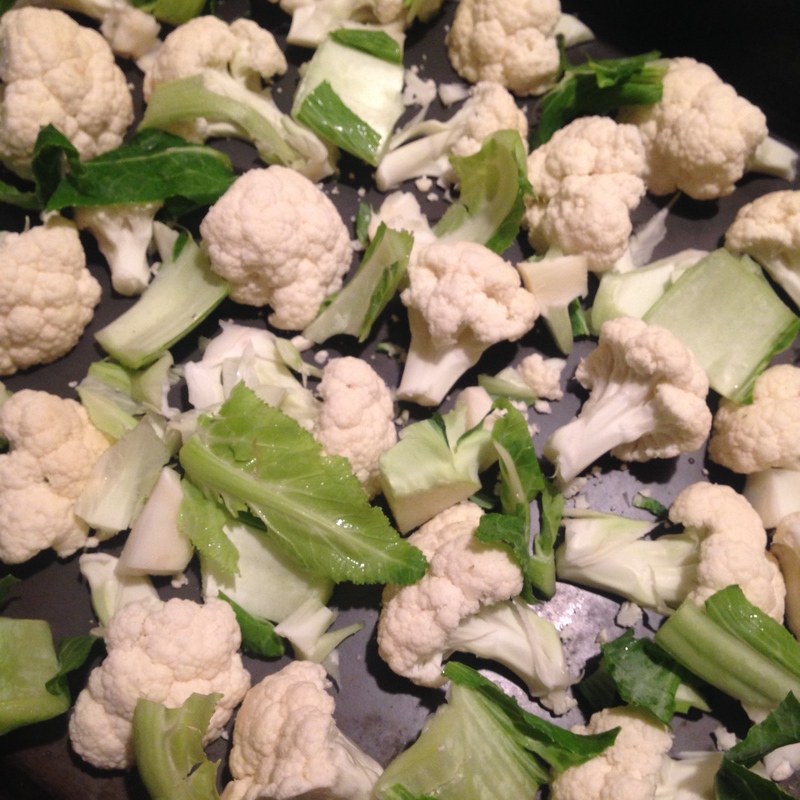 Or simply chop up the cauliflower and greens and use in a flatbread or omelette. Remove the greens of the cauliflower. Chop these into pieces no larger than an inch and a half. Wash and pat dry. Core the cauliflower. Cut away the base of the stem and any dirty bits. Chop the core into cubes of about one inch square. Separate the cauliflower into florets. If the florets are large, slice them in half. 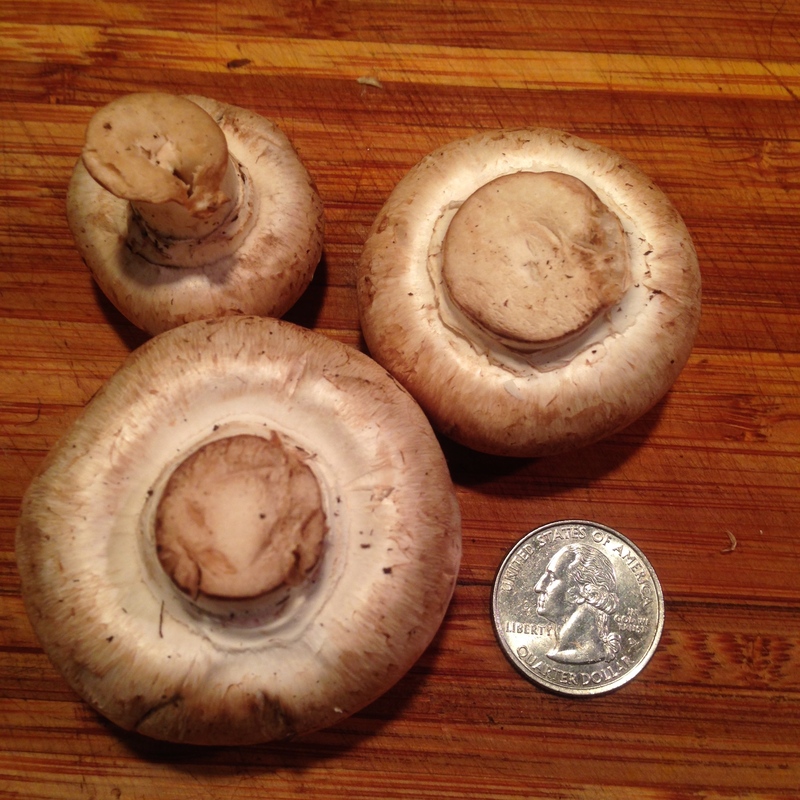 If the florets are exceptionally large, cut them into thirds. You want large, flat-ish pieces for this recipe, so cut lengthwise and try to maximize surface area. Very small florets should be avoided, they will just burn up. Toss the florets, greens and stem pieces together with olive oil to cover. Make sure that the cauliflower is well-coated but don’t worry about getting every inch. Resist the urge to use too much oil, it will impeded the roasting process. Lay the coated cauliflower and greens in a large, heavy, deep roasting pan. Allow for space between each piece (as pictured above). If you feel like you are overcrowding the pan, roast in multiple batches. After five minutes, remove the pan and shake it a few times, tossing the cauliflower as much as possible but making sure that it is all still flat in one layer. Return to oven. After five minutes (ten minutes total), remove the pan and place it on a trivet. Using tongs or careful fingers, turn the florets. Sprinkle with kosher salt, taking care not to use too much. Return to oven. After five minutes (fifteen minutes total), remove the pan and place it on a trivet. Turn pieces if necessary. Add freshly ground black pepper to taste. Adjust for salt if necessary. Return to oven. After five minutes (twenty minutes total), remove the pan and place it on a trivet. Test for doneness by cutting into one of the thickest florets. Taste if necessary. If it seems thick and stodgy, return to the oven for another few minutes. At this stage you may add oil, if you feel that the cauliflower is too dry. I haven’t found it to be necessary. The cauliflower usually emerges tender inside from the combination of high water content and high heat, while the surface areas have a fine crispness that would be blunted if extra oil were added. Serve this immediately or at room temperature. Hell, it’s good cold. Four ingredients, people. As previously mentioned, this can be endlessly varied in terms of seasoning. One of my favorite things to add is paprika, especially a strong characterful Spanish or Hungarian paprika, hot or sweet, smoked or not. I would add any powdered spice ingredient with the salt, and make sure to give a more vigorous shake. One could also add powdered spices or dry herbs to the oil that the cauliflower is tossed with. I would add dry herbs in the last five minutes of cooking, fresh herbs only when the cooking was finished. This is a dish exceptionally suited to buffets, meals of many small dishes, or meze / tapas / antipasto type spreads. Since it is still excellent at room temperature, it’s perfect for longer parties and more relaxed occasions. It also pairs well with a hearty, complex main course, and can stand up to many a sauce. It is also a great alternative to starchier sides such as roast potatoes, and makes an excellent second vegetable alongside anything green. 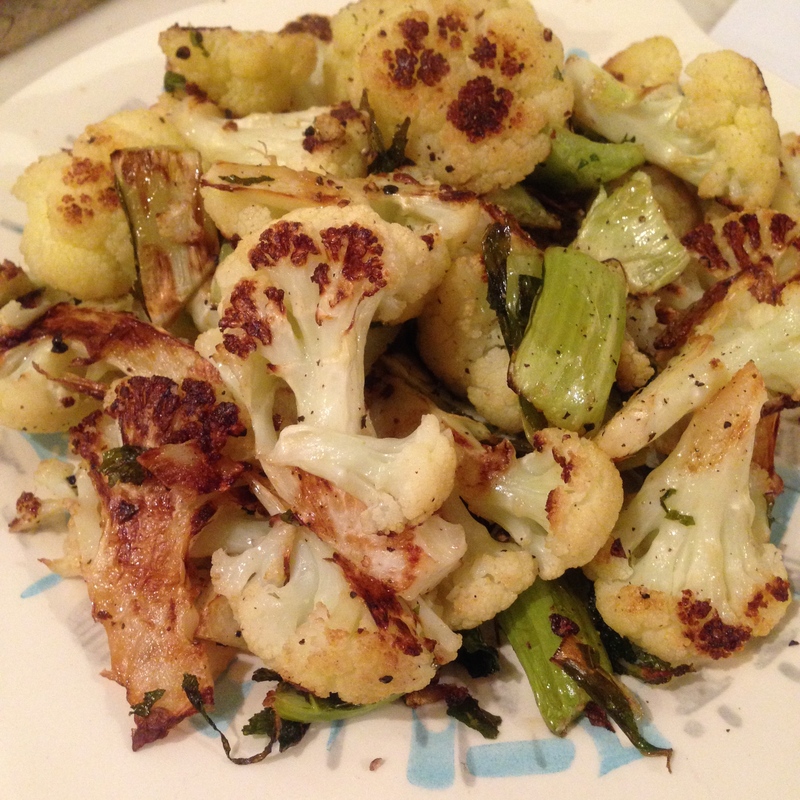 You will notice that the greens and stem of the cauliflower are used in this recipe. Don’t discard them, they are quite tasty and mild. All Brassica plants (cabbage, kale, mustards, broccoli, etc.) are edible from root to seed. Some parts of some plants are too bitter to be palatable, but most simply require the proper preparation. 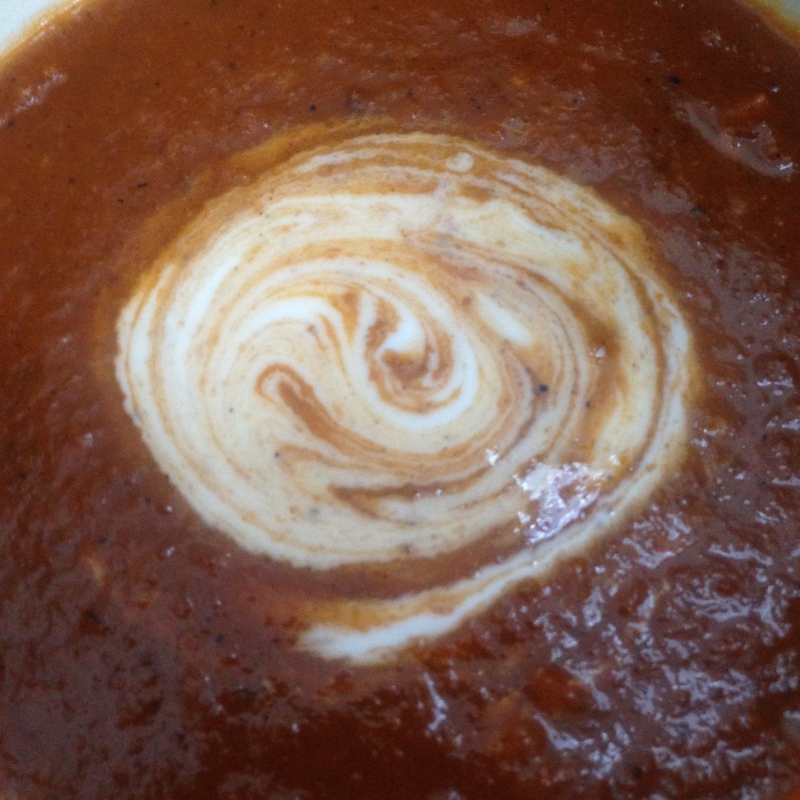 Bring to heat in a small saucepan, then keep warm. Keep warm for 5-10 minutes, stirring once or twice. The point at which to take the next step is ideally when the dried herbs have all settled to the bottom of the saucepan. Strain the broth from the herbs and serve. Obviously this could be embellished in a million ways. 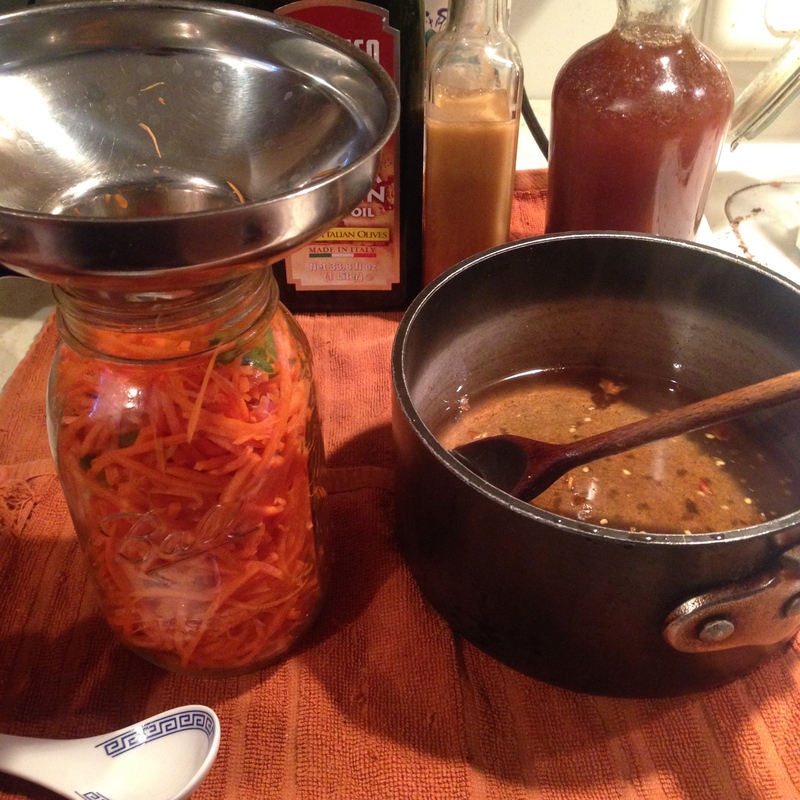 The broth itself can be varied endlessly, depending on what you have in your pantry. It’s best made from a broth that’s deep and flavorful that you just made, perhaps even with something as basic as leftover vegetable scraps or chicken bones. The herbs can be from your garden or the store or the wilds, as long as they are dried this will make a nice flavorful broth from these proportions. I would also recommend not using more than one very bitter herb and not more than one very sweet herb. You want to use the more “culinary” herbs whether wild or domestic. This could be used as the base of a soup, or served as I sometimes do simply with thick noodles and whatever condiments suit you. 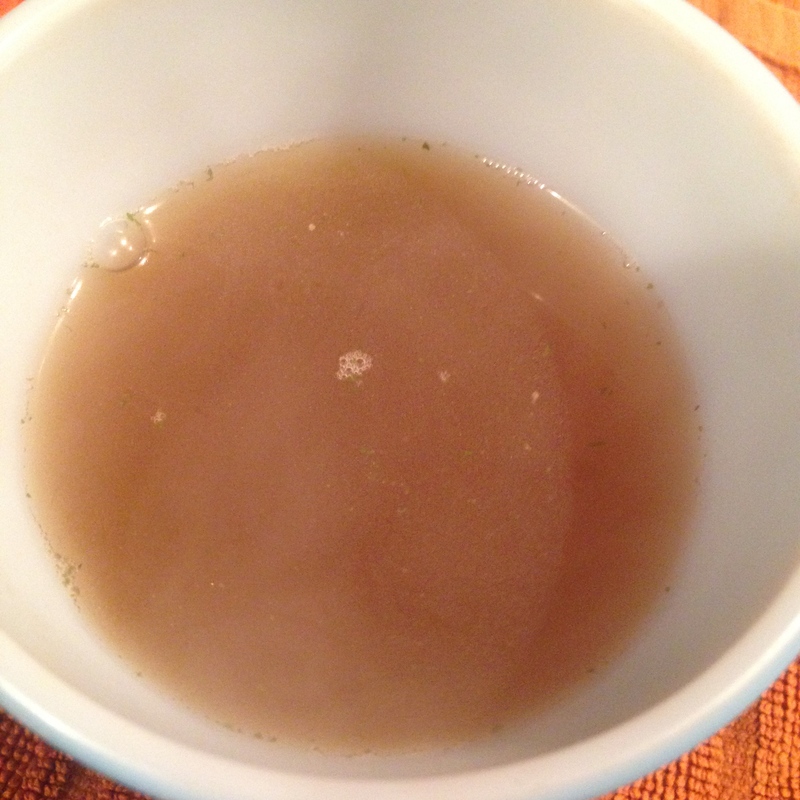 Primarily, though, this is a warm nourishing broth somewhere between a tea and a soup. Strong, complex and slightly bitter. While not explicitly medicinal it contains quite a few medicinal herbs. I’m not making any claims it’ll heal you, but it feel good. 2 large unpeeled Italian eggplants (about 2 lbs), sliced in half, stem end trimmed. Rub eggplants with olive oil and place in a large roasting pan, large enough that the halves do not touch. Roast @ 425° for 15 minutes, then remove. Puncture each piece with a fork or knife. Seperate the skin from the cooked pulp of the eggplant, reserve the skin for another use. 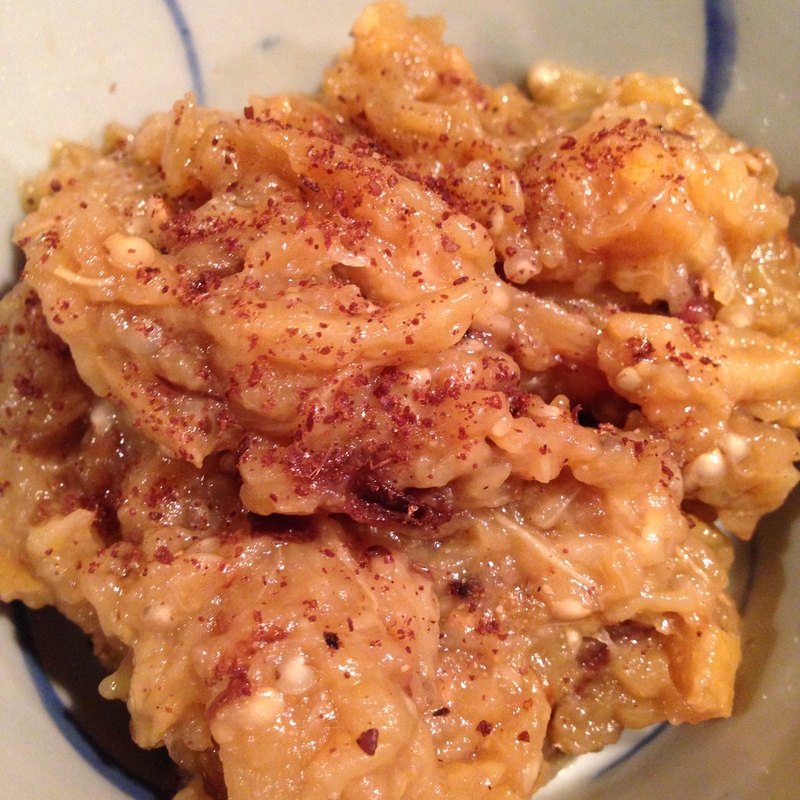 Mash the eggplant pulp to desired consistency, or puree if need be. *I would add 1/4 cup, combine, taste, and then add more as desired. 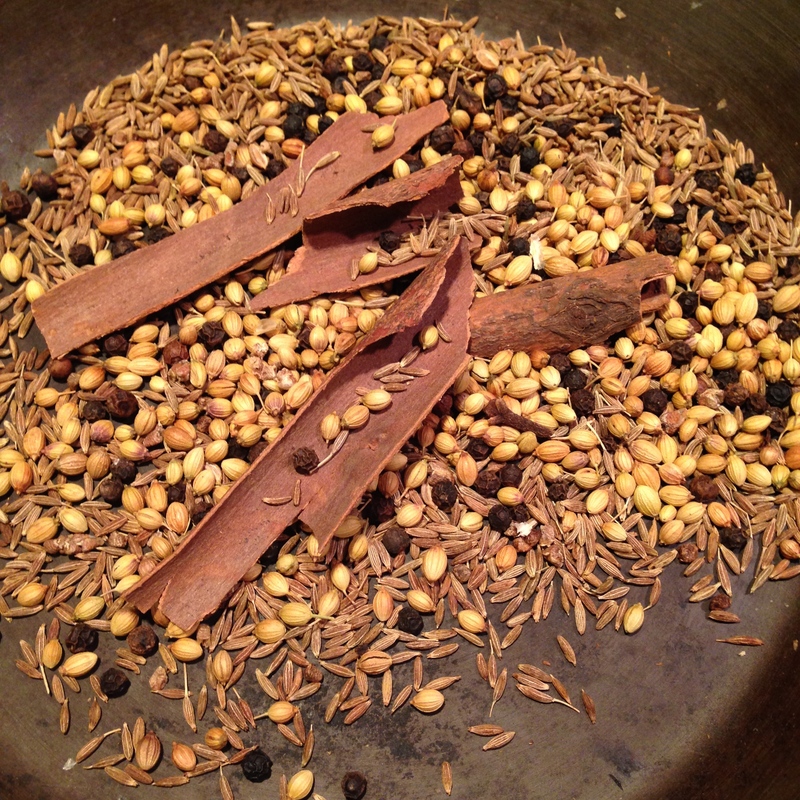 1 tsp or more of cumin, preferably freshly toasted and ground. Before serving, allow to come to room temperature. Then add extra olive oil, if desired. Pinches of dried ground sumac or paprika. Excellent served as part of many meze or appetizer dishes. 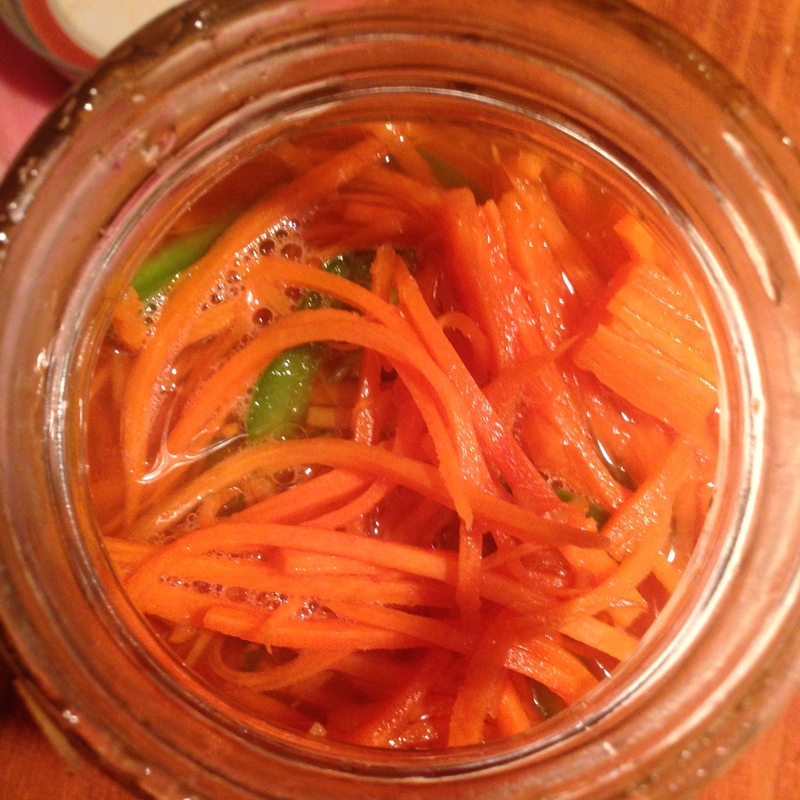 Perfect with flatbreads of all kinds, but also makes an excellent dip for raw vegetables such as celery, carrot and parsnip. One could of course add many other ingredients to this before overwhelming the taste of the eggplant and preserved lemon. In addition to other spices or herbs, yogurt could be added, especially if one is looking for a creamier dish. I prefer to leave this one chunky, and scoop up big swathes of it in celery boats. Ah, to each their own. KEY : The key fact to remember with this dish it so serve it at room temperature.